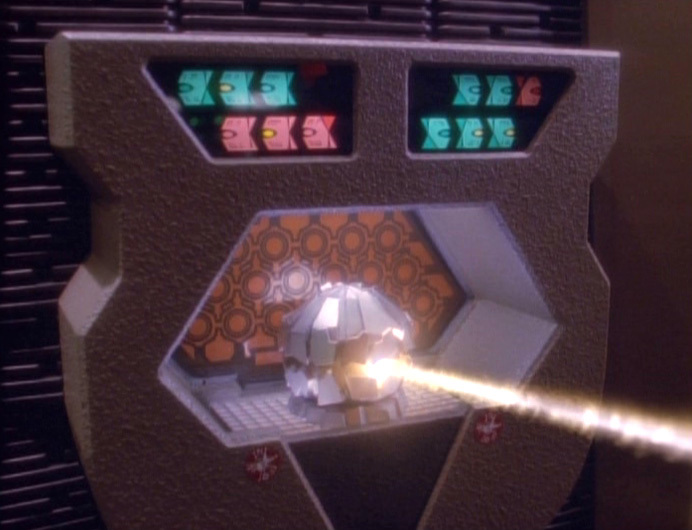 In the DS9 episode "Civil Defense" Gul Dukat has hidden an automated phasor turret in the replicators. This is activated by Sisko and O'Brien accidentally triggering an old Cardassian security measure while cleaning one of the mining areas. Eventually the protocols decide that the bridge had been taken over by rebels and the turret appears, targeting all non-Cardassians. That is something that was hidden in the replicator and was revealed by a specific set of circumstances. Theoretically such a thing is possible since you can add items to the database by scanning them and use the replicator to reclaim suitable materials back into the bulk storage. That being said, the replicator doesn't seem to have been used for this purpose in any Star Trek episode. For what it's worth, the "Transporter Buffer" has been used to store produce and even people on several occasions. The engineering principles are similar (replicators contains a small transporter) so I wouldn't expect it to be more than trivially difficult to accomplish. Has the color of child Spock’s ears in the Star Trek reboot ever been discussed? Has Counselor Troi ever produced a concrete conclusion using her Betazoid abilities that would otherwise be unreachable? How did the Female Changeling know that no Changeling had ever harmed another?